Interesting. For me eating 1200 cal spaced evenly through the day results in very little weight loss and a lot of hunger. On the other hand, something that has always worked for me is paying attention to meal timing. Leaving space in-between meals with NO’ snacks (irregardless of meal composition). One of your charts seems to explain why this works. Still, if I eat a lower carb meal with NO snacks, the weight loss is faster. Maybe grazing is the biggest problem. I hate to do it, really I do but irregardless is not a word. I’m doing this reply to appreciateeeeeeeeeeeeee verrrrrrrry verrrrrrry much your great effort ..
thats amaziiiiiiiiiiingly helpful and clear the mind very much .. i had a bunch of conffussion about the higher amounts of protien & amino acids but that cleared it alllllllllllllll and made all my info. making sence .. THANK YOU VERY MUCH .. AND SORRY FOR THOSE WHO DIDN’T APPRECIATE I GUESS THEY DIDNT GET IT!!!!!! As it turns I’ve been taking you up on your challenge of eating 5000 calories of mostly fat with some protein. I’ve lost 15 lbs in a month and dropped two inches from belt. You are correct that there are healthy cultures that consume carbohydrates, but they are generally consuming carbohydrates in their starchy forms not highly processed forms. Furthermore, you did not address the multitude of diet studies that show that overfeeding (up to 7000 calories a day) for months on resulted in a range of 1 – 10 lbs of weight gain. With regards to insulin suppressing appetite, I don’t have access to the study, but I wouldn’t be surprised if that’s the case with HEALTHY individuals. Insulin resistant individuals would obviously be resistant to the appetite suppression effects. Another observation– 75 grams of carbs is not a low carb meal. That’s my total carb consumption in a day. Someone having that as a single meal is in the range for 225 g of carbs a day. Try eating zero carb and supplementing with 225 g of sucrose a day and see what happens. I bet you’ll put on fat and start developing symptoms of metabolic syndrome. As a powerlifter, I’m well aware of the insulinogenic properties of whey protein and branch chain amino acids. I purposely supplement with pure glucose and BCAA on weight training day to aid in post workout recovery. On workout days I consume gargantuan amounts of protein and lean meat and as little fat as possible. To summarize, while I don’t agree with the premise– insulin is not evil, I do not agree with the spirit of your post. The data you point out above is merely indicative that the human body can adopt to a variety of diets based on whole foods. To top it all off, you cherry picked the portions of your study to interpret them to match your view points. 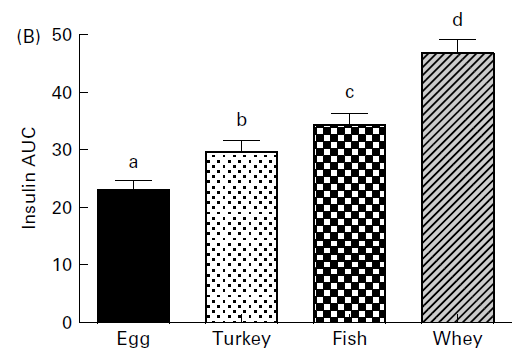 Take a look at the study you cited for beef (http://www.ncbi.nlm.nih.gov/pubmed/9356547) being as insulinogenic as brown rice (not even counting the fact that brown rice is not nearly as insulinogenic as white rice). 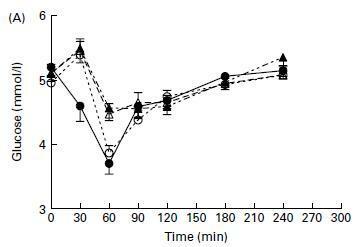 However, protein-rich foods and bakery products (rich in fat and refined carbohydrate) elicited insulin responses that were disproportionately higher than their glycemic responses. 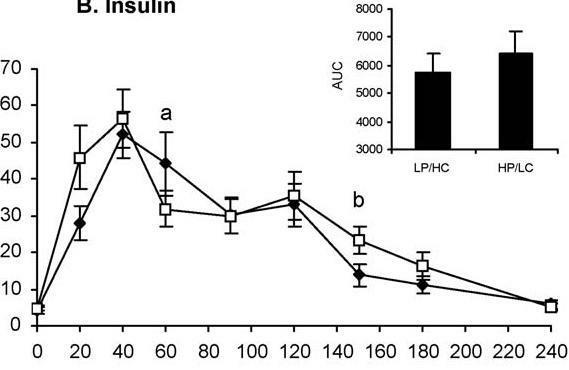 Insulin spikes with protein to drive nutrients to muscles. That makes sense. Drinking fat and highly insulinogenic protein (such as whey) will depress your glucose levels as insulin signals multiple things at the same time. Thus while insulin plays a critical role in healthy people in modulating anabolism, when you’re up-regulating anabolism and consuming lots of fat, you’re going to store fat. Throw in some insulin resistance that reduces the appetite suppressant effect and you’ll be even worse off. For people who have been eating industrialized crap the entire lives, the damage to their metabolism might be so great that caloric restriction alone will not be an effective way of restoring insulin sensitivity. One of the most effective way to restoring insulin sensitivity is to go low carb. 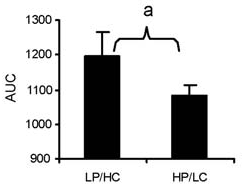 Not only that your lipid and metabolic panels will improve. Matthew – all I can say – is AMEN! Thank you Matthew. 75 grams! That chart showing insulin swings creeps me out – I used to be on that roller coaster, and it was hell. Great comments! I recently switched from low-fat to low-carb and I’m seeing faster fat loss while still being able to increase strength. Cholesterol levels have improved as well which was my initial concern. The only problem I saw in the article, was when James compare carb with protein. Protein and Carbs are not comparable. Protein is a building material and should not be used for energy. 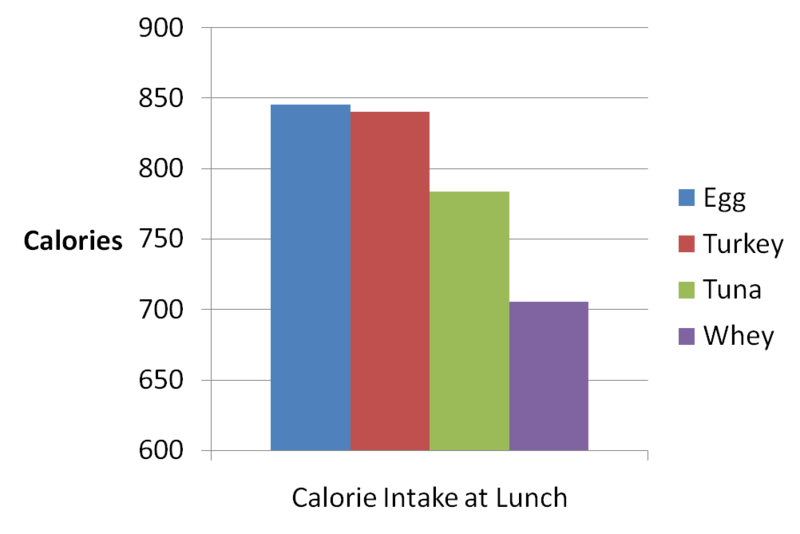 Fat is the energy source comparable to carbs. If that comparison was done, of course one would spike insulin and the other won’t. Comparing high carb diets with a high protein diet is a bogus study. Protein will give energy only by converting into glucose. So what’s the benefit. But yes carbs have its uses. They are not as good a fuel source as fat, but they are not bad, if there is no metabolic syndrome. The real misconception is that glucose causes metabolic syndrome. They don’t. It is the proteins which come along in the bad carb sources that do most of the damage. Or it can be non-glucose so called carbs, that may cause damage. It can also be the poly unsaturate fats that cause damage. The really safe fuels are only glucose and saturated or Mono-unsaturated fats. That is the bottom line. There is no rule that protein “should not used for energy.” Why shouldn’t it be used for energy? Fat is also not a comparable energy source to carbs. Fat contains 9 calories per gram, while carbs contain 4 calories per gram. Thus, fat is much more energy dense. And where is your evidence that carbs are not as good of a fuel source as fat? Why do you think glycogen and glucose the preferred energy source for your body for high intensity exercise? And where is your evidence that proteins that come with “bad” carb sources (whatever a “bad” carb source might be) that do the most damage? You have made a number of assertions without any evidence to support those assertions. In fact, there are many recommending that. Also, as other have posted, this works in the reduction of adipose tissue. I am surprised that with all the research available that there is still such a high level of ‘lipidphobia’ among nutritionists. So what’s this got to do with insulin? I think the point most people are making is that you wrote an article out of spite and malice. This isn’t to help people, it’s to hurt someone, maybe Taubes, maybe someone else. All I know is that you cherry-picked your studies and EVERYONE sees it. You ought to be ashamed of yourself…. I think the point most people are making is that you wrote an article out of spite and malice. First, you have no evidence that this was written out of spite or malice. Second, even if it was, it still does not refute the information provided in the article. The motivation for writing an article is irrelevant to whether the content is factual. I’ve had numerous people contact me personally and told me this article helped them and educated them. You really have no clue why I wrote this article, do you? All I know is that you cherry-picked your studies and EVERYONE sees it. If the studies are cherry picked, please show where they are cherry picked and how. You ought to be ashamed of yourself…. F*cking good article! My mind is blown, will tweet and post on our facebook wall. I’ve always been pro-carb and it annoys me greatly when they are unfairly vilified as a basis for paleo and other ridiculousness. Thank you, PropaneFitness. Yes, I agree with you, the whole “carb villification” movement has been quite ridiculous! There are so many things that do not apply to a “damaged metabolism” here. More on my Site. Hmmmm. You said that the following is a myth: “Carbohydrate Drives Insulin, Which Drives Fat Storage”, yet you did nothing whatsoever to “dispell” it. If anything, you actually agreed with it entirely. First, you agreed that carbohydrates stimulate insulin production. Second, you also agreed that insulin plays a role in lipogenisis. Now put 1+1 together… where’s the myth again??? 1. You point out that other hormones have a role in regulating fat storage. Of course they do. The real question is to what extent different hormones have an impact on the regulation of fat tissue. You provided ZERO evidence that insulin either does not play a role in fat accumlation, or that its role is a limited one. Biology 101 says that insulin is the primary hormone involved in fat accumulation (by a country mile). No one disputes this and you have not provided any evidence contrary to this. An individual with type 1 diabetes will find it virtually impossible to accumulate fat due to inability of his or her pancreas to produce insulin. Studies show that the injection of insulin into these individuals will result in subsequent weight gain. 2. The elevation of Insulin per se does cause you to be hungry. However, the reduction in blood sugar that occurs following (not during) an insulin spike does cause hunger. This explains why eating a high protein meal does not stimulate hunger soon after digestion (despite increasing insulin), yet a high carb meal almost certainly will. 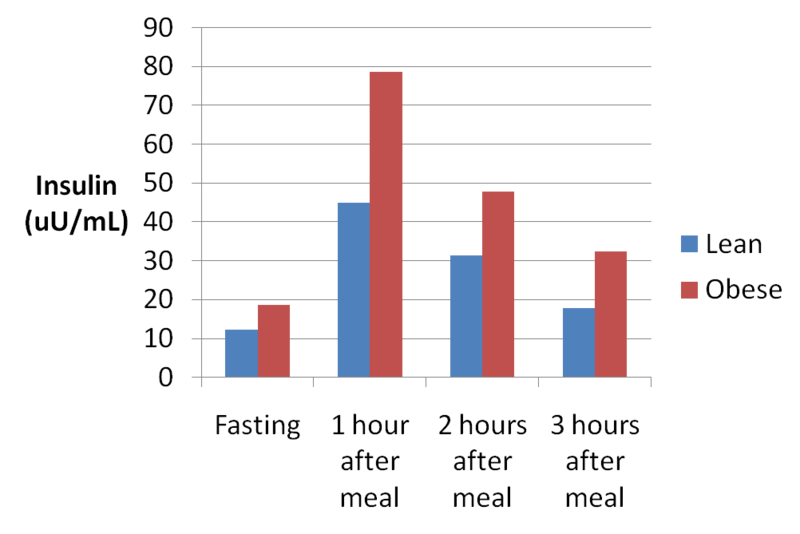 Carbohydrates spike blood sugar (which insulin subsequently knocks down), while protein does not. 3. It is the combination of (a) high blood sugar caused by consumption of carbohydrates, and (b) high insulin levels that work together to cause fat accumulation. High protein diets do not trigger weight gain, because they do not raise your blood sugar. High levels of insulin without a source to store fat (glucose) will not result in weight gain. Therefore, a low-carb dieter need not avoid or limit protein consumption. 4. You accurately describe the short-term link between blood glucose and insulin production, but ignore the potentially far more serious long-term link between the two. The major concern here of course is the problem of insulin resistance. 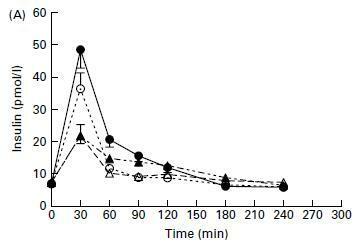 Do certain high-carb diets (particularly those high in fructose) induce insulin resistance over time? As one becomes insulin-resistant, the amount of insulin in the body becomes exceedingly high and weight gain is almost a certainty unless carbohydrate consumption is severely restricted. There are many researchers (most famously Robert Ludwig) that believe our enormous consumption of sugar is the root cause of insulin resistance. I don’t reply because if I were to reply to every single person who makes comments on my site, my entire day would be nothing but arguing with people on the internet. Responding to Mike or such individuals is far, far down on my priority list. Mike is clearly mistaken in his thoughts and assertions and, if I actually get time to respond, I will, but there are other priorities. If arguing with people on the internet is your or Mike’s priority, then more power to you. James, im sure you have time. you obviously just don’t know how to reply to such a solid counter argument given here by mike. Robert, that’s pretty arrogant of you to think you know my schedule and how much time I really have. Mike’s counter argument would require a lengthy detailed reply which will take more time than I currently have. If you or Mike want priority in terms of my responses, you would have to be a paying subscriber. Random people who leave comments on my site are the lowest on my priority list. well, you certainly had time/will to reply this 2 coments, despita their don’t relate to any of your “priorities”, but still didn’t managed a way to answer Mike’s well observed points. The debate would only be beneficial to everyone who reads, but it just seems you’re not interested in it. I responded because it only took me 60 seconds to type it. It would take me significantly longer to respond to Mike’s points, an hour or longer. You obviously have a very distorted concept of time, but perhaps that doesn’t surprise me since you seem to think everyone has time to engage in lengthy debates with random people on the internet. Perhaps this excerpt from an Anthony Colpo post applies to you? In addition to plentiful information, these individuals, having gotten use to the instant nature of email and online chat, now believe that everyone in the world is just like them: Living unfulfilling lives, sitting day-long at their computer ready and waiting to answer any email and chat the minute it appears on their screen. Heaven forbid these people stop to consider that other folks actually have lives to live and have very limited time to answer the abundant email they receive each day. Actually, my time perception is fine thank you, at least fine enough to aknowledge that from December 12th several hours have passed. Again if it would be of your interest i believe you could already replyed to it. I’m perfectly aware it’s up to you to reply to whoever and whenever you want, but come on, the point here is that refuting Mike’s arguments would greatly improve the debate. Don’t get me wrong, i’m not picking on you but i like to see diferent perspectives on this subject and feels like a lost oportunity to do it. This is such a merky ground that we easily found tons of people who take on tons of diferent diets/lifestyles and still acomplish their goals in health or fatloss. Theres no magic formula, so as i already said, this kind of debate would be great. Based on what i’ve read so far, i’m with Mike on this, but if you could prove me wrong i would apreciate it. 1) You are somewhat correct about the excess blood sugar which may lead to fat storage, but if you recall, he pointed out a 23% discrepancy. It is not as dramatic as you imply. What proof do you have that the high blood sugar is converted to fat? Are you a scientist? Can you prove or disprove this? Did it occur to you that it is the type of “carbs” you are eating which drives responses in the body? At the end of the day none of us here are researchers, doctors, or scientists, but instead of just spitting out what ever he feels (as you have done), he has provided ample documentation to support his points. 2) His article was not focusing on all the different hormones related to fat storage, it was related to insulin specifically and the myth that protein does not cause insulin spikes. You frame point #1 on some alien premise of what the article is actually about. Read it again carefully and try to get the message he is conveying. I will help you: he provided graphs showing consequences on insulin from eating various foods or by obese/lean subjects. 3) I could not find it anywhere by the way that, “blood sugar” increased weight gain. Your own beliefs are not valid, I mean your opinions. Provide some facts or sources, then talk. 4) The body converts everything to glucose, and our brains prefer carbohydrates. This is the actually the Number 1 fuel source for the body. You wonder why most Americans are dying of some disease by their 40’s or 50’s and they ate a high protein diet which is at the cause of most diseases today, as noted by doctors! (see eating meat is bad for you, a simple search which will provide a wealth of information). Our bodies respond to the excess protein via damage to the kidneys, heart, etc. 5) Since everything is converted to glucose eventually (this is a fact)…our bodies run on it, this is “our energy.” then it should occur to you that what matters the most is number of calories and the types of foods we are eating———–> Example: Okinawans live on Complex carbohydrates, fruits, tempeh or miso (ideal form of soy) and they live to 100 while here in good old USA finding a 70 year old who isn’t on 10 medications or dead is rare! 6) There is alot that is still being learned on the subject. You should be grateful someone took the time to investigate this and disproof the myth that only carbohydrates are at the cause of insulin spikes (which before you wrote on this topic, you took the time to understand the implications of insulin spikes, as he attempted to). 7) PS I am someone who went down 4 pant sizes eating complex carbs whether vegetables, lentils, fruits, and I love rice, grains, and occasionally ate eggs and fish. I am 100% proof you don’t need a high protein diet to lose weight. I did this doing minimal exercise of 4 hours of walking a week, and eating 2 meals a day, but totaling about 1150-1300 calories a day (I am 5’5 and now weight 127 lbs).. I am healthy and never hungry, and if I am hungry I eat. but I am always nourishing my body and my body thanks me for it. Just as it does the Okinawans who are mostly healthy and vibrant into their 90’s. Actually, the biological process of fat accumulation through insulin from consumption of high carbohydrate diets is about as well understood as any by biologists in the field. Mike, it’s absolutely possible to store fat when insulin is low, have you not heard of Acylation Stimulating Protein (ASP)? I suggest you start looking more into the counter-arguments against Taubes position (This site, Carbsanity.blogspot, Lyle Mcdonald and others) and lay off the smugness in your posts in the mean time as you may look back in embarrassment in years to come. so high fat low carb and moderate protein is bad? No. 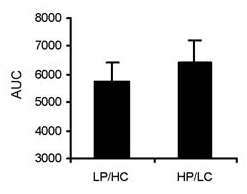 High fat, low carb, moderate protein seems to work well for a large number of people regarding weight loss. This diet will not work for everybody though. Some find that they need to make the diet a plain one. (lessen the good taste, suddenly food doesn’t look so appetizing anymore). You do not want to ingest too much protein because it can work as a poison unless there is adequate fat in your diet to prevent protein overdose. I liked this analogy the best. Imagine eating from a stovetop that is COVERED in cookies and cakes just piled up on top of each other. Then imagine eating from a stovetop that is PILED with turkey and ham and steak. Thanksgiving is an excellent example of this. The cookies will be gone in days, the meat may have to get thrown out (or frozen). I was a low carber for over 10yrs, from the Atkins to the Dukan diet and yes they all helped me lose weight. I am not stating my experience in dieting but the fact that I had to continue dieting for this amount of time and i never truly reached my goal weight for any longer than 3 months. It is forums like this that let me to do my own research and trails and forget about the actual science which seems odd to say coming from me but the reality is that I am now at my goal weight and have retained a lean physique without any exercise and while eating all the foods that I missed out on a low carb diet. I now weigh 72kg, I’m in my 40’s and have abs all year round yet I eat several full pizzas every week as well as all the other foods I love including large packets of chips and family sized blocks of chocolate, as does all my clients. I get regular checkups and I am healthier now than when I was in my low twenties. What matters to me now is what works and not what others say or the research behind their conclusions. I use my diet on hundreds of clients and still maintain a 100% success rate even with thyroid issues. The biggest change in my diet was however due to a study on Insulin and protein which led to my reducing meal times, extending fasting and carb loading to boost metabolism and prevent cravings. I average 1.5% body fat loss per week even with my pre-comp clients and that’s with a minimum 3-4 full carb load days per week (loading varies from 200-600g carbs per day). Glycogen is of coarse monitored with intentional overspill for one of the 3-4 days of carb loading. I also reduce aerobic exercise (increased anaerobic to utilise glycogen). 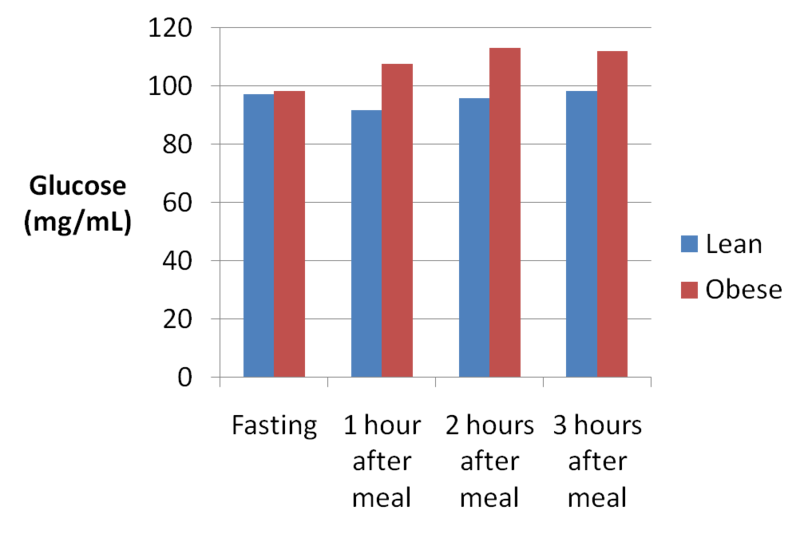 The biggest weight loss gains were only seen after altering the fasting period which did not work with protein and/or fats alone even with a small amount of carbs. Better results are also achieved if the carbs are consumed at night and even processed carbs such as white bread can provide a better result on certain days depending on the next days food program (best before a carb load day with complex carbs). I am now trying to introduce timed fructose into my diet before liver glycogen is full just to see the effects. This alone has taken over a 18 months as I like to be thorough and test with as many individuals with varying weight and health conditions as possible. So far there has been no benefits except when adding sucrose (50% fructose) during carb loading on an overspill day to help store some body fat in order to lose more body fat in the following days. Obviously most restrictive diets work but at I wouldn’t rely on the loss being anything permanent. There are obviously ways to eat the foods we have grown to love and not be too concerned about the extra carbs or calories so long as the food intake and food types are timed with as little glycogen overloading as possible. It is all trail and error but worth the time to test it for yourself. Any way, keep up the good work. Love the site and the fact that you do respond to so many negative remarks despite your obvious intention to provide useful information to people like me who take in on board and incorporate it into my diet plans even if just to test different outcomes. It is not a coincidence that our brain runs on carbs and our bodies prefer carbs as our primary fuel source. Countless medical sources back up this fact. If we eat 5 burgers vs the equivalent calories of bread (say 10 buns), won’t we still gain weight? Ultimately, everything is converted to glucose in the body whichever macronutrients we are discussing (carb fat or protein). The key to weight loss for me (and I am mostly a vegetarian who survives on complex carbs including lentils and some proteins from eggs, fish, dairy on occasion) was no snacking, 2 meals a day under 600 calories typically 450 and intermittent fasting. I have seen it over and over on the web how waiting between meals allows the body to burn fat. See this blog he provides ample examples just as this site did: Getting stronger Intermittent Fasting for health and longevity. The Okinawans by the way live to 100 on average and they live on carbs including rice, vegetables, fruits, some protein. Another favorite book of mine is Fasting and Eating for Health: A Medical Doctor’s Program for Conquering Disease by Dr. Joel Fuhrman. This site by the way and your graphs are great! There is so much brainwashing going on in the net about a paleo diet eating high meat diets with vegetables when in fact this is a sure fire way to experience the numerous problems associated with meat eating and which lead to strokes, heart disease, numerous cancers, by your 50s, and that is even if you exercise. It doesnt solve the damage it does to your internal organs. oops 🙂 posted this in the wrong spot at first.